Mal Meninga, Matt Gidley and Jamie Lyon - a trio of Australian centres - who set Knowsley Road alight during their trophy-winning time at St Helens. Now fellow countryman Ryan Morgan is set to step into their boots and hopefully enjoy as much success as his predecessors. The former Melbourne Storm no. 3 has signed a three-year deal and says he is excited at the prospect of pulling on the red vee jersey of what he describes as ‘one of the most famous Rugby League clubs in the world’. He is particular keen to make his mark playing alongside the likes of Jonny Lomax, a fit-again Tom Makinson, Mark Percival, Adam Swift, Theo Fages and Matty Smith - a frightening-looking one to seven with genuine pace to burn. “I’ve always wanted to come over to England at some stage and may have regretted not doing so,” said Morgan, who started his senior career with the Eels in 2011. 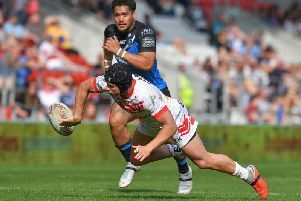 He went on: “Initially, I spoke to head coach Keiron Cunningham on the telephone and his passion and dedication to Saints was immediately obvious to me and he also explained how he wanted to build the club going forward. “I then spoke to my father and told him I couldn’t turn down a once-in-a-life-time offer like this. He gave it his own blessing and now I hope to buy into Keiron’s aims and ambitions. “Naturally, I have ambitions of my own to fulfil and those obviously include success in both the Super League and the Challenge Cup. Despite jetting into this country at a time when the winter weather began to bite, Morgan is having little difficulty in acclimatising. The family atmosphere which exists at the club was evident to the Aussie from the moment he stepped off his incoming flight.